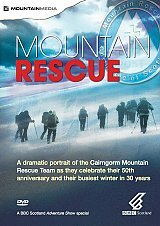 2013 was the fiftieth anniversary of the Cairngorm Mountain Rescue Team and, in that time, they attended over three thousand incidents. In what's been their busiest winter for 30 years, a film documentary team went out with the men and women who rescue walkers and climbers in difficulty from what, in storm conditions, is one of the most inhospitable landscapes in Britain. First broadcast on BBC Scotland, this widely praised documentary is a compelling but unsensational insight into the work of one of our MRTs. It gives a comprehensive picture of the work they do, the conditions they operate in and will enable people who aren't walkers or climbers to understand the attraction of the mountains in winter. Including intimate interviews with team members, this is the most comprehensive portrait of how this voluntary team operates. It is essential viewing for everyone who enjoys Scotland's mountains. As seen on BBC Scotland. Approximate running time 40 minutes.